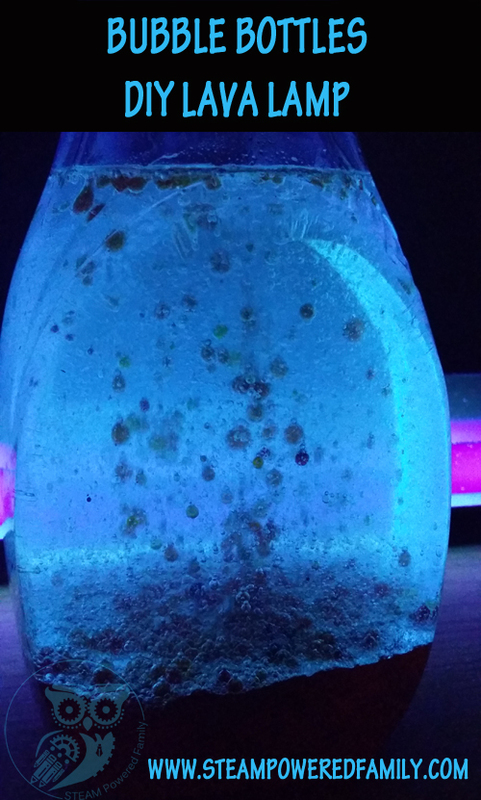 Bubble Bottles - DIY Lava Lamps - With Glow Power! 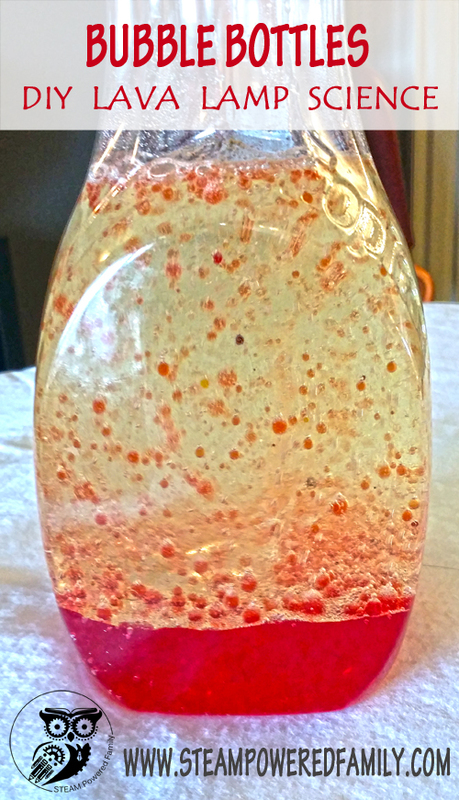 Bubble Bottles – DIY Lava Lamps – With Glow Power! Sometimes we try something that makes the boys just stop and silently stare in wonder. Other times my kids come up with brilliant ideas that result in some pretty amazing things. 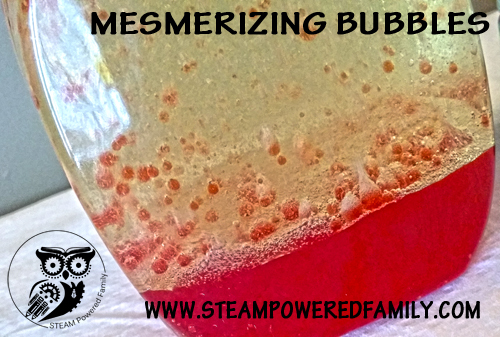 This week both things happened when we made Bubble Bottles (or DIY Lava Lamps)! The kids and I were fascinated by the little beads of colour that bounced joyfully in our bottles. They were not hard to make and the results are stunning! Younger children can watch while you demonstrate, but older kids can help with this project. ~ Fill the bottom of the bottle with water to about 1.5” deep. In our 1.75L bottle this was about 1/2 cup. ~ Take a moment to admire how oil and water don’t mix and create layers of awesomeness! ~ Wait a moment to take in the beauty of diffusion as the colour starts to blend with the water at the bottom after falling through the oil. ~ Sit back and watch the magic happen! 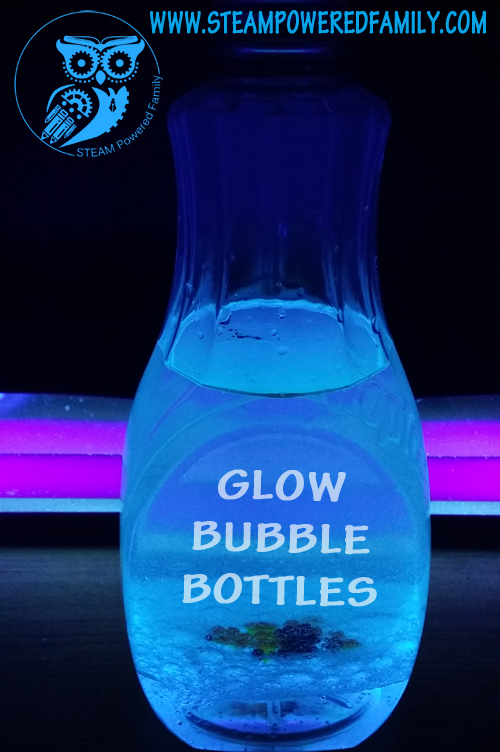 After building our first Bubble Bottle Jackson announced that he wanted to try it with Tonic Water instead of plain water to see if we could make a Glow Bubble Bottle with our black light (affiliate link). Always ready to take things up a notch we decided to go for it. And it worked! In fact, it resulted in some really cool and unexpected results. The food colouring sat in a layer between the oil and tonic water, only mixing once we added the antacid. We then tried adding two different colours. With water as the base the colours started diffusing and blending right away. But with the tonic water the beads of colours once again sat on top of the tonic water. When we added the antacid the food colouring started diffusing but not before creating beads of colour in both colours before they slowly blended together to create our new colour. See how the colours are sitting between the layers? And they are not blending with each other either, just resting in perfect little colour beads. Check out the amazing and mesmerizing results under black light and regular light! After a few more tests with Baby Oil and Vegetable Oil. We discovered that Baby Oil held a lot of air bubbles which caused some issues with the colour beads breaking and also clarity of the solution. Vegetable was definitely the better choice for oils. I bought the cheapest oil I could find. We also tried a water bottle that had ridged sides but we found the colour beads became trapped in the groves. Smooth sided gave the best visibility and awesomeness! If the reaction starts to slow down you can add a little more antacid. Once the reaction is completely finished, and this could take hours if you added a lot of antacid, you can put a lid on it and store it. Then you can add more antacid at any time to start the reaction again, BUT only put the lid on once the reaction is COMPLETELY finished. Gases are being released and will create a lot of pressure so do not cover it while it’s reacting. Once you have the lid on, make sure it’s on tight, then you can tip the bottle and watch what happens to the liquids. If you’re careful, you can also pour off the oil to use it in a new bubble bottle. Overall this experiment was a big success. I know we will be doing it again as we progress through various science units. ~ Exploring the chemical reaction (the antacid reacts with the water and releases CO2 gas which rises to the top in a bubble of colour, at the top the bubble pops releasing the CO2 into the air and the food colouring drops to the bottom again because it has a higher density than oil). ~ Diffusion as the food dye mixes with the water in wonderful swirly patterns. ~ Colour mixing if more than one colour of food dye is used. ~ The black light glowing powers of quinine if you decide to try Jackson’s twist with the tonic water! ~ For further study on chemical reactions Jackson is currently reading Basher Science Chemistry (affiliate link). So much learning in one very mesmerizing experiment! This looks like a fun project to try with the kids this summer or a good project for a Mad Science Theme birthday party! What a great activity for the summer! Thanks for linking up to Blogger Brags. I’ve pinned your post to the Blogger Brags Pinterest board.